Wowza! 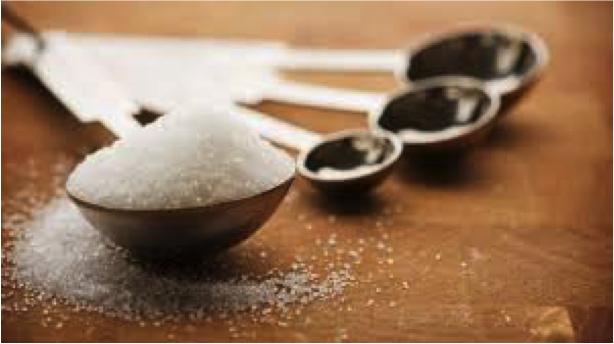 According to the USDA (US Department of Agriculture), the average American consumes more than 22 teaspoons of added sugar a day! That’s much more than the recommended 12 teaspoons per 2000 calorie diet. Obesity is an epidemic plaguing many Americans. Occasional treats are fine, but when we over consume sugar laden foods, we are taking in excess calories which can lead to obesity and can increase our chances of multiple health problems. This excess of calories associated with obesity is linked to many chronic diseases such as heart disease, diabetes and cancer. 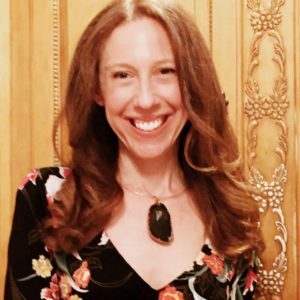 For anyone in cancer survivorship, maintaining a healthy weight and consuming an overall healthful dietary pattern is key to help prevent recurrence. Some of us may have the best of intentions for healthful eating, but unfortunately, plenty of foods contain more sugar than we would expect. Treats like candy, cookies, cake and ice-cream we expect to be high in sugar, but thanks to some savvy marketing, foods and drinks that seem healthy may actually contain just as much sugar and possibly even more. In general, foods without added sugars are preferred, but depending on the item, it may or may not be a healthy and/or impart additional health benefits. What does no added sugar mean? No added sugar means that additional sugars were not added to the food during the manufacturing process. If a product is labeled “no added sugar” but you still see grams of sugar listed on the Nutrition Facts, then those sugars are naturally occurring. Fruits, vegetables and dairy have natural sugars in them. For example, milk contains lactose, a naturally occurring sugar. Lots of foods harbor more sugar than we would expect and unfortunately some foods perceived as health foods may actually be detrimental to our health. What foods are hiding more sugar than we expect? Flavored Yogurt – Yogurt has so many healthful ingredients like calcium and protein in addition to live cultures, but when manufacturers add sugar to it, it negates those healthful components. Some flavored yogurt, even yogurts marketed to kids can have too much added sugar. Ketchup – When we think ketchup, we think tomato, which is a healthy food. Just 1 Tbsp of ketchup is 4 g of sugar which is equivalent to 1 teaspoon of sugar. Most people use much more than that amount so it’s a big contributor to sugar in our diet. Mandarin Oranges in Light Syrup – Mandarin oranges should be healthy since they are a staple in the Mediterranean diet, but one 1/2 cup serving contains 19 g of sugar, that’s almost 5 teaspoons of sugar. The word “light” may sound like a health halo, but “syrup” is a sugar and depending on the amount added, it can be a lot more than you think. Organic Peach Tea – It seems implied that peach tea would be healthy and organic is an added bonus. But don’t be fooled, organic foods/drinks can be just as unhealthy as their non-organic counterparts…even if it contains organic cane sugar instead of white sugar. Some bottles of iced tea contain 25 g sugar which is greater than 6 teaspoons of sugar! 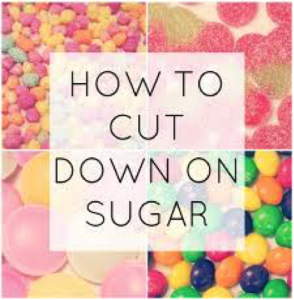 We need to cut back on the amount of added sugars we consume, but it’s key to make healthful foods taste delicious so you don’t feel like you’re missing out when trying to cut back on added sugars. Buy plain versions of food, like oats and yogurt and add your own sweetener ~ this way you control the amount of sweetener. Look at the food ingredients list, if sugar is listed as one of the first 3 ingredients that’s usually a telltale sign that it has too much. 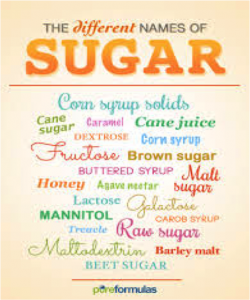 Learn other names manufacturers use for sugar so you can spot it on the label (see above). Use spices to enhance the taste of food. Replace foods traditionally high in sugar (candy, cookies, cake) with grilled fruits and vegetables. Grilling caramelizes the food and naturally ups the sweetness. Drink water or green tea instead of sugary beverages. Add fruit, vegetables, herbs & spices to water and unsweetened tea to enhance the taste. It’s definitely OK to have sugar and treats in our diet, but use as occasional treats! Once we start taking a more mindful approach, we’ll be able to eliminate some of the unnecessary added sugars we are consuming.